We left the fabulous Waderick Wells feeling like we could easily spend another week, however we were getting a bit low of veggies and there was lots more to explore. Leaving at close to high water against the flow of the current was a much nicer experience than arriving. 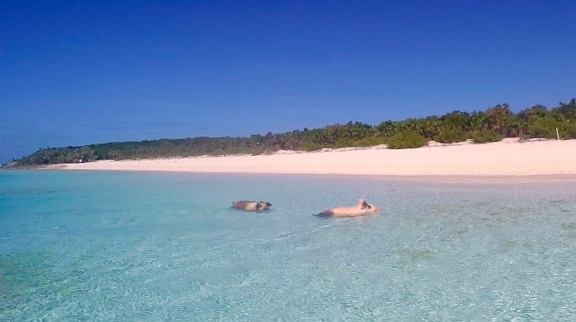 We then had to work our way over a shallow bank of sand to get to the slightly deep water on the inside of the reef. It was a stunning day with gentle east winds, so we set the sails and had the most incredible sail on a close reach with flat seas and only a metre or two of water under the keel. 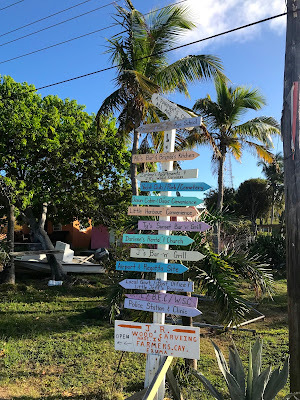 We had planned to check out some other places along the way but we were having such a great sail we carried on to Staniel Cay and dropped the anchor at Pig Beach – Big Majors Spot– and yes we could see the pigs swimming as we came in. This was a beautiful big bay with several sandy beaches and with 50 boats at anchor; the busiest place we have been in quite a quite. We passed our friends on Ciro as we came in and agreed to meet up for a drink on Askari later that afternoon. First things first though was to go and see if we could get any veggies and drop off our rubbish at Staniel Cay Yacht Club. Staniel Cay Yacht Club is really just a resort with a great bar and restaurant plus a few chalets and a small marina. It felt really buzzing though as we arrived with lots of boats coming and going, guys selling lobster on the dock and sharks circling the fish cleaning station. We went to find the two Supermarkets – well more like corner stores. One is pink and the other is blue – too funny as that’s how they are named. 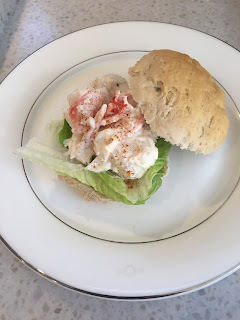 We grabbed a few bits, but the mail boat that was due in today had been delayed so we had to wait and go back a couple of days later – that’s island life! However, the laundry come liquor store didn’t disappoint! We grabbed a quick rum punch at the yacht club then headed back to Askari and drinks with John and Gail. Next morning I paddle boarded to see the pigs – Andrew had decided he’d seen enough of the pigs in the Abacos. I went when the tripper boats had left and sure enough a couple of the pigs swam out to me. It was a bit freaky as I didn’t want them too close, the idea of swimming with them as they pee in the water was not really very appealing. I did get a little clip of my ‘Piggle Boarding’ exploits though. We chilled out in Piggy Bay for a few nights as it was a little bit windy. 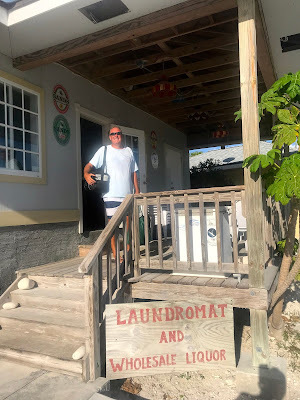 We got the groceries stocked up and had a great lunch at Staniel Cay Yacht Club. On the next table we met a couple who have been circumnavigating for 37 years – they will complete their trip when they go to Florida but have been putting it off having spent the last 3 years in the Bahamas – they had some amazing stories. We got back to find that Sea for Miles had anchored next to us, we last saw Anja and Bob in Newport RI. So that was of course an excuse for a drink! Then we all went to sundowners together on the beach. The cruising community has set up the beach with sunshades, tables and even a BBQ. There appears to be a system where the French Canadians have it some nights and the Americans the others – how bizarre that there should be this separation! One of the things we have learned since coming to the Bahamas is that many people in the north east of the United States and Canada have seasonal jobs as it is just too cold during Jan – March so lots of them keep boats either in the Bahamas or in Florida and then just move aboard for these months – home schooling kids and having a little bit of adventure. The outcome is that lots of them know each other really well as they’ve been doing this for years and many of them hang around in particular bays, just living in the Bahamas. What a cool work life balance and it has been really great seeing so many boat kids too. We decided we were going to move on however Bob and Anja convinced us we couldn’t leave without going to the Thunderball Grotto (so named from the James Bond movie). So the next morning and low tide we picked them up and all went to explore the grotto. It was actually fantastic and even though it was packed with tour groups when we arrived, they soon left and we had the place to ourselves. Bob showed us some neat swim throughs and Anja and I spent some of the time just sitting on a rock marvelling at the really cool cave. On the way back we saw a lovely turtle and then a shark – all caught on camera! The next few days we hopped around and had lovely anchorages all to ourselves on Great Guana Cay. We really couldn’t believe this was possible in the Exumas which has so many boats, however there are so many anchorages and most boats seam to congregate around the settlements. Most days we had a short sail, dropped the hook and then hiked to the ocean side or walked on the beach. It was a really special few days. One day we got all our dive gear our and gave Askari a good clean ready to get back out in the ocean. Our final day in the Exumas was spent at Little Farmers Cay. We anchored just north of the Cay away from the current that rushes in from the Cut in the reef there and went snorkelling. I spotted a lobster and now being out of the national park we went and grabbed our Hawaiian sling. The lobster was tucked right in so Andrew prodded it from behind and eventually it came out enough for me to grab it, with thick gloves on. The first attempt didn’t go well as tentacle just came off in my hand, but the second go I just grabbed it’s head – oh wow my first lobster. We took it back to the boat and cooked it up for lunch in a homemade bread roll – totally decadent and delicious lunch. Just after lunch we spotted La Mischief anchoring alongside us – oh gosh that always means trouble….. We arrange to meet up with Steve and Dee at Tys beach bar later and went to explore the island. Little Farmers Cay has about 70 inhabitants most of which descend from a freed slave called Chrisanna who settled on the island with her two sons. The sons later purchased the island from the British and willed the island to their decedents who can build on it but not sell it to outsiders. In front of the island there is a deep cut out to the ocean creating amazing clear water and strong currents on the East of the Cay but we took the dinghy through and had a thrilling ride, we beached the dinghy at Tys and then went to explore. We walked over the island to the government dock and the main settlement – on the way we met Denzel. Denzel had a mountain of Kalik (the local beer) bottles in his and a hammock with a mattress both in his garden – we were afraid! 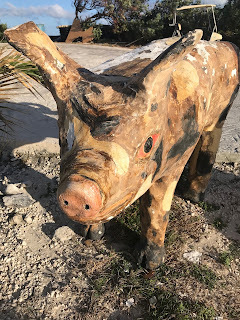 Denzel insisted that we should come and see his pomegranate tree and try the barracuda he’d just cooked up….. what a character, we left with a pomegranate, some leaves that I had no idea what they are and some of his homemade tamarind paste…. We gave him a few dollars and promised we would come and visit him if we wanted to see the turtles in the bay…. The harbour is really pretty and indeed does have turtles, rays and beautiful caves. 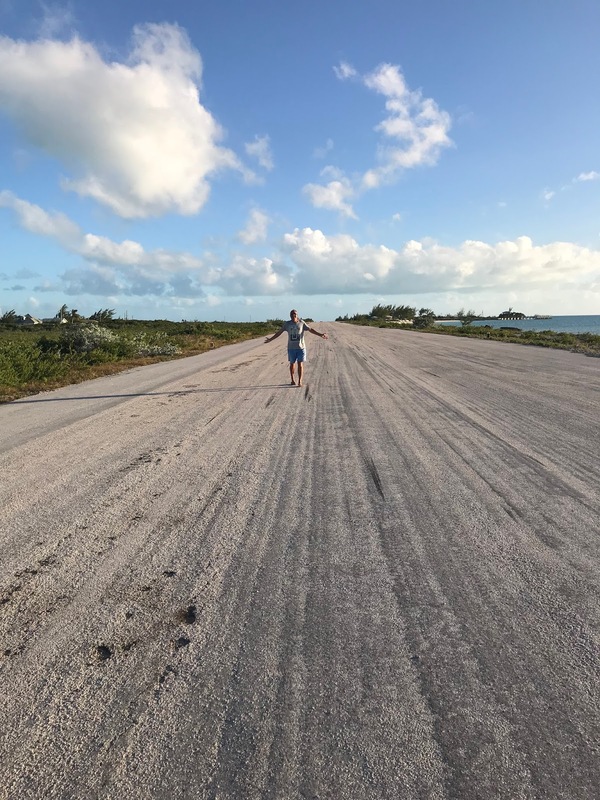 We walked on and found our way to the yacht club, traversed a creek and then found ourselves on the airstrip run way – luckily that lead straight back to Tys. There was quite a crowd of cruisers, we had dinner and a few beers before trying to find our way back to the anchorage with only an iphone for a light (yes I know we should know better). 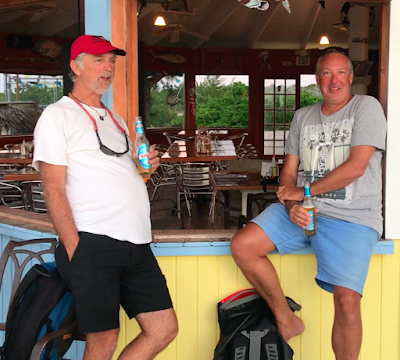 The next morning we got up early and headed south to the Galliot Cut and left the Exumas behind for a great sail to Cat Island. We left with a stream of boats intent on motoring into the wind to George Town which seems to be the ‘holy grail’ of anchorages in the Exumas; we heard there’s about 300 boats there and some call it ‘adult day care’ – so not for us!